Rite.. while June 4 looks like weeks away but time flies pretty fast. Let us start discussing this here; all are welcome to post, ask questions, provide suggestions etc. Plan is tentatively to drop in to location morning of June 4 (Sat) which is our Agong's B'day so will be a public holiday for everyone. We aim to start the Day One gaming around 9-10 am and do a full day till 6pm. Break for dinner, then it's the start of the famous After-8 Gaming session where you get to sample games like 18xx, Dune, Diplomacy maybe even TI3? Sunday we start again at 9 am (after breakfast) and game till 2-3pm. that'll conclude our one-and-half day of Retreat Gaming. Prizes will be there of course! 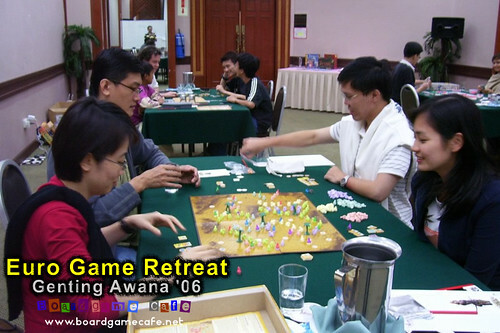 And there's also this 2006 report of the one we did at Awana Genting. Has it always been "competition" style? Seems a bit stressful.. haha. I think there should be a game where everyone can play - Wits and wagers teams, werewolf, etc. We can also come in costumes? If we get a few more interested players, sure, TI3 it is! Yes we shud whip out a werewolf session. We always wanted to do that but the After8 Gaming venue was not suitable (like OTK style). So hopefully this trip at PD allow us to do so. Average about rm150-200 (with t-shirt) but excluding accommodation. But participants get to buy a game from us at 40% discount so you kinda get a rebate there. This time if we are doing it at PD, cost shud be lower. kaz: in my experience, although it is competition style, it is VERY friendly, some more there are ladies too. so it's err... casual competition? darn it guys, can't make it to this session. have fun! Sweet! 2 full days of gaming, i.e. possibility of completing ONE game of World of Warcraft! Jokes aside, this looks very, VERY fun. Looking forward to more details.